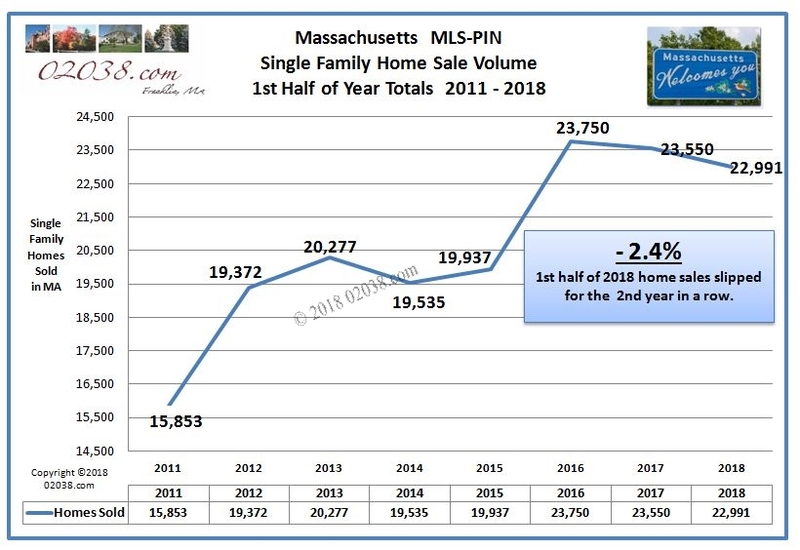 However, a slight decline in single family home sales volume so far this year might arguably be a warning sign of an impending slowdown in the MA market’s upward momentum. But a closer look at what happened at the start of the last real estate downturn in 2006 seems to indicate that trouble may not yet be on the horizon for today’s strong housing market in Massachusetts. The statewide median single family home sale price in the first 6 months of the year, as reported by MLS-PIN, continued a climb that has been unrelenting since 2013. The median single family home sale price rose 5.4% during the first half of 2018, compared to 2017’s half-year median. 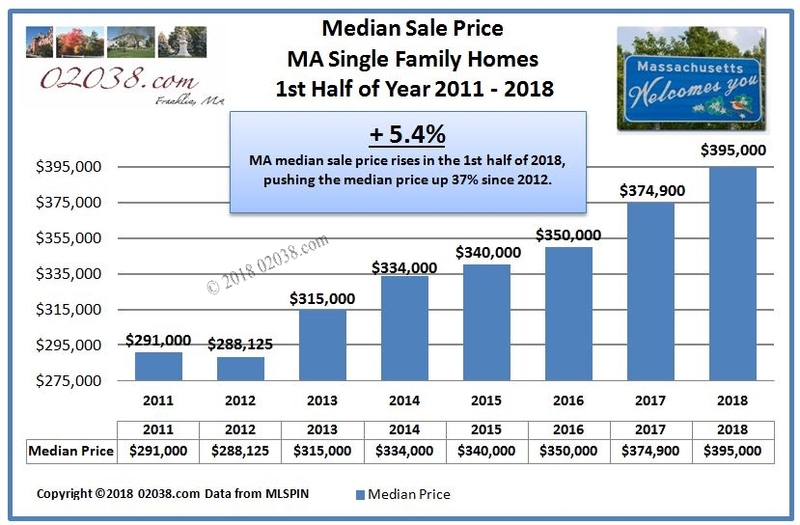 This was the sixth year in a row of rising midyear median home sale prices, putting MA’s median price 37% above where it stood at the midpoint of 2012. As recorded on MLS-PIN, statewide single family home sales volume fell during the first 6 months of 2018. This was the second year in a row that MLS-PIN records show that fewer single family homes changed hands in the Bay State. This tapering off is fairly minor, leaving midyear sales volume still near record highs. But the decline could nonetheless be interpreted as evidence of a budding resistance by home buyers to today’s ever-rising home prices. Let’s take a look back at the last real estate market cycle in MA to see whether the current sales decline could be signaling that there’s a slowdown ahead for Massachusetts real estate. Home sales activity at the top of the last market cycle back in 2005 – 2006 does bear some similarity to recent sales events. 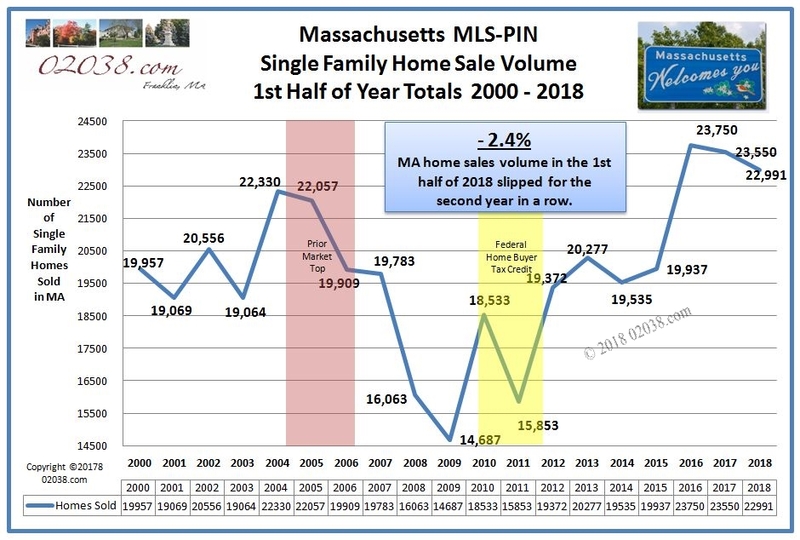 2006 saw the second year in a row that MA single family home sales volume fell. That 2-year slowdown in sales in 2005 and 2006 was followed by a much more pronounced downturn in 2007 – 2009, which was triggered by the Great Recession. However a closer comparison of the real estate market of 2006 to current market conditions reveals some very important differences. These differences may indicate that we are not facing a significant market slowdown now for the foreseeable future, despite the recent 2-year decline in home sales volume. On a percentage basis, the home sale slowdown in 2006 was much larger than 2018’s sale sag. In the first 6 months of 2006, 9.7% fewer single family homes sold on MLS-PIN compared to 2005’s first half total. That’s a sizable drop. In 2018, on the other hand, the midyear sales decline was only 2.4%. 2018’s decline is fairly mild, lessening its potential for future significance. The next chart demonstrates another key difference between market conditions in 2006 and 2018: there were vastly more homes for sale in 2006 than there are today! There were over 30,500 single family homes for sale across Massachusetts on MLS-PIN in July 2006. It was relatively easy to find a home to buy in 2006 simply because there were so many homes for sale. The 9.4% drop in home sales volume in 2006 can’t be blamed on inadequate supply. The slowdown in sales in 2006 was very likely due to a pullback in buyer demand, as the market headed toward the Great Recession. 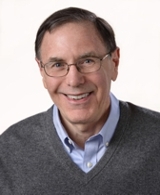 In any market, declining demand is a significant warning of an impending downturn in prices. This July, there are just under 12,000 homes available for purchase on MLS-PIN. That’s 61% fewer homes for sale now than were available in July 2006! In July 2018, it’s really difficult to find a good home to buy because there are so few homes to choose from. 2018’s mild slump in home sales volume very well may be mostly (or even entirely) due to the current extremely tight inventory. It is possible that home buyer demand in 2018 may not be faltering at all. That buyer demand for homes may not be weakening in 2018 is reinforced by the chart below. The chart shows current home inventory levels, expressed as months of inventory. The chart covers a variety of geographic markets in Massachusetts and compares current inventories to supply levels of past years. The chart above shows just how extremely low the supply of single family homes for sale is in 2018. (6 months of inventory represents a market in equilibrium. 4 months denotes a seller’s market.) 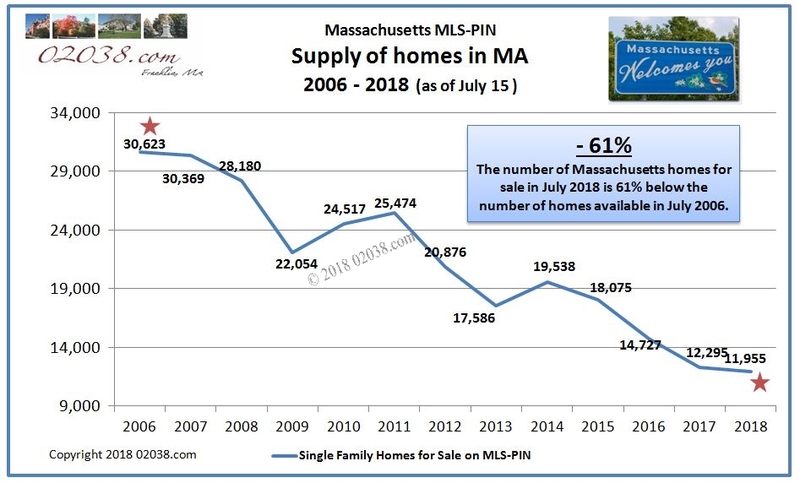 With only 3 months of supply, or even less, in all the geographic markets shown in the chart above, current conditions in Massachusetts are very much tilted in favor of home sellers! 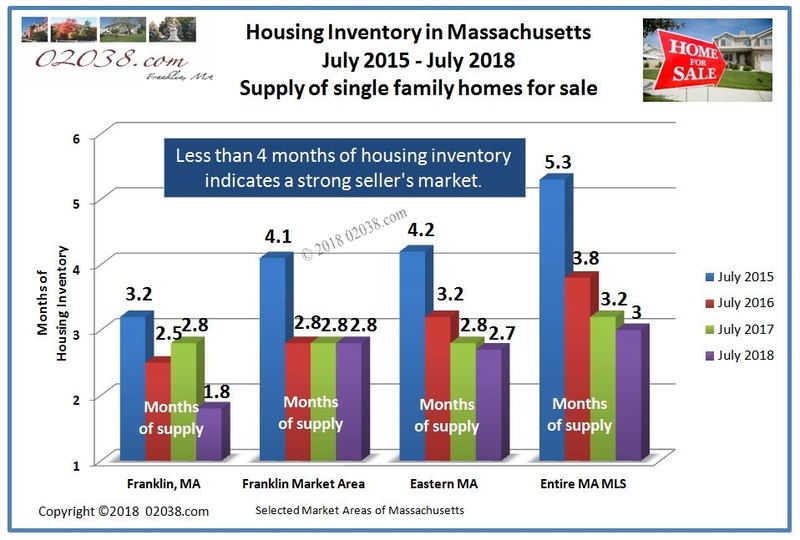 What’s most significant in the above chart is the fact that housing supply in the broadest, most important markets shown in the chart (Eastern MA and all of Massachusetts) is tighter this July than it was in July 2017. And July 2017’s supply was lower than it was back in July 2016. Ever tighter supplies indicate that demand for housing in MA has not been faltering at all. The slight slowdown in home sales volume in Massachusetts this year seems not to have been due to a fall-off in demand. With demand for housing apparently intact, Massachusetts does not seem poised at midyear 2018 for significant market weakening or home price declines any time soon. At the halfway point in 2018, the Franklin real estate market is having a banner year. 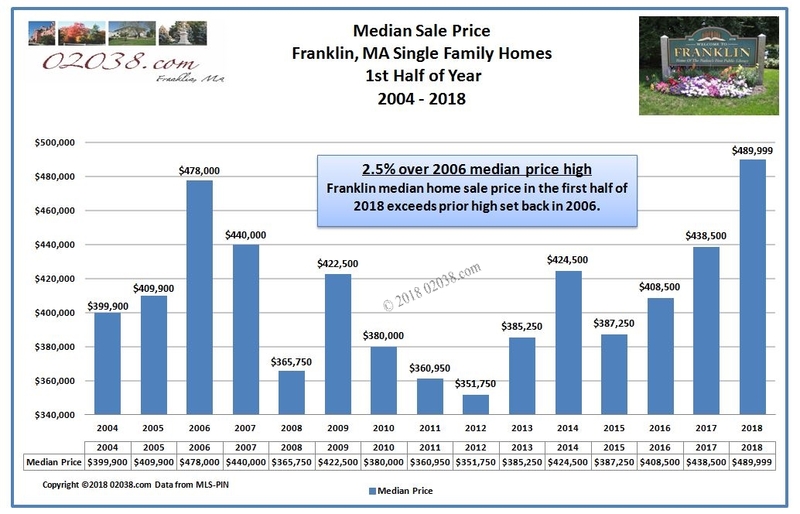 Franklin’s single family home median sale price is at a new all-time high. At $489,999, the median stands 2.5% over the prior high set back in 2006. 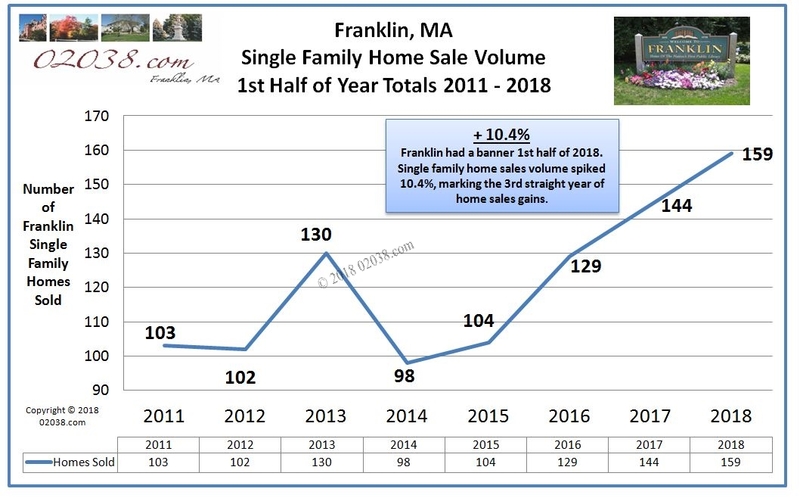 It’s the same story with single family home sales volume in town: 2018 has been a great year so far in Franklin! No market – good or bad – stays the same forever. It makes sense that, at some point in the future, today’s vigorous housing market will soften. Home sales volume and housing inventory levels will be leading indicators of any future downturn. As the post discussing the possibility of a Greater Boston Bubble suggests, don’t bet against the MA economy and don’t try to time the market. Buy (or sell) your home when the time is right for you. Please contact me if you’d like my help in determining your best moves pertaining to buying or selling real estate!